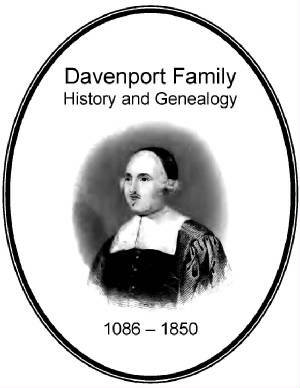 The following families have genealogy eBooks on this page: Coleman, Davenport, Day, Deacon, Green, Pardee, Proctor, Shimer, Sprague, Stanford, Stevens Stephens, Stimpson, Sturges, Tripp, and Warren. Welcome to Bookshelf 14 at Hawkeyes Trading Post! Coleman Family History and Genealogy or Genealogy of William Coleman of Gloucester Massachusetts. PDF eBook English 13.5 MB 1906. A fabulous reference which contains numerous rare ancestral photographs, with essential dates on family ancestors from the year 1619 up to 1906. A period of over 280 years! An index of 48 pages is also provided listing the hundreds of descendants and in-laws contained in the eBook! 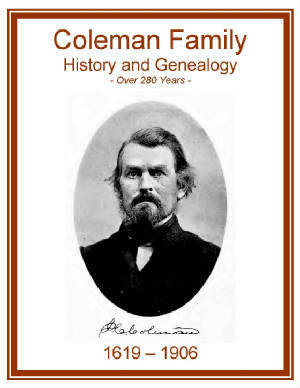 A must for any Coleman family genealogist! Price $6.95 USD. 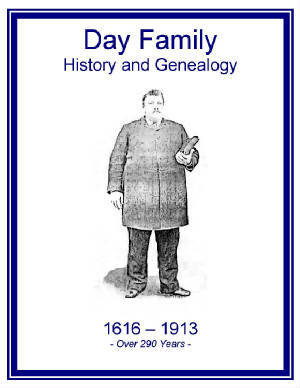 Day Family History and Genealogy or Descendants of Jacob Day and Anthony Day. PDF eBook English 10.9 MB 1915. The Day family history includes 11 generations of descendants that extend from the year 1616 up to the year 1913. There are several pictures and poetry written by family members of long ago! Also, a 15 page index of family members and in-laws provides over 2000 names which are contained in the eBook! An excellent resource of Day family genealogy! Price $6.95 USD. Green Family History and Genealogy or Genealogy of the Family of Timothy and Eunice Green from 1723. PDF eBook English 12.6 MB Year 1904. Before the year 1700 there were 80 persons with the name of Green who might be regarded as family founders, that were spread across the colonies and considered 1st settlers of New England. This eBook contains church records, short stories, biographies, occupations, enlistments in French & Indian Wars through the American Civil War. There is a 16 page index containing over 1,200 names of Green family members and in-laws. Essential dates range from 1723 up to 1902! 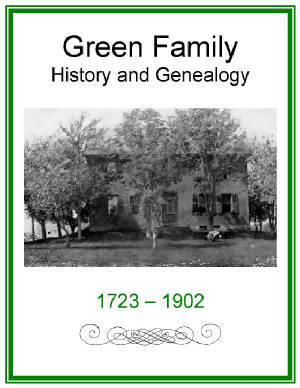 Great documentation for the Green family genealogist! Price $6.95 USD. 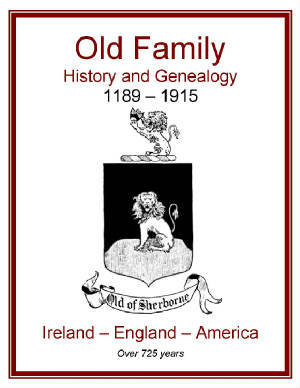 Old Family History and Genealogy or the Olds (Old, Ould) Family in England and America. PDF eBook English 15.4 MB 1915. A detailed well written account of the ancient family of Old from England and Ireland, with details of the family origin at both locations. Essential dates of family descendants are recorded from the year 1189 up to 1915, and an index of 22 pages lists over 2,500 family members and in-laws! A treasure of genealogical information for anyone in the Old, Olds, or Ould family! Price $6.95 USD. Proctor Family History and Genealogy or A Genealogy of Descendants of Robert Proctor of Concord. PDF eBook English 14.5 MB 1898. This eBook provides the legend of the family origin that dates back to 1436. 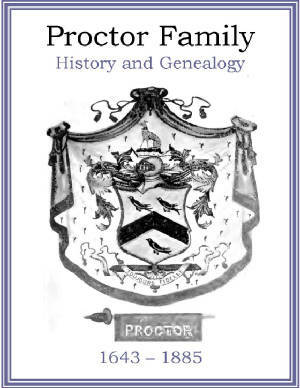 Essential dates for family descendants are given from 1643 up to the year 1885, and there is an 8 page index of Proctor family ancestors! The text copied poorly from the hard bound edition since the pages had faded with time, yet the text is readable when magnified and will provide a rich resource of over 240 years of Proctor family history! Saved from the ravages of time! A great genealogical resource! Price $6.95 USD. Stanford Family History and Genealogy PDF eBook English 7.67 MB Year 1906. The Stanford genealogy comprises the descendants of Abner Stanford, the revolutionary soldier. There are 10 generations listed that span the years from 1644 up to 1905! A rich history of a Colonial American family with an index of 26 pages listing hundreds of kindred and in-laws. A great source of genealogy for the Stanford family! Price $6.95 USD. Stevens Stephens Family History and Genealogy or Lineage from Henry Stephens or Stevens of Stonington, Connecticut, 1668. PDF eBook English 15.8 MB Year 1909. 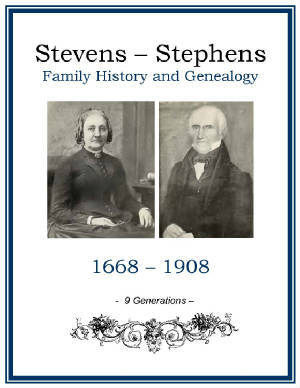 An excellent account of the Stevens or Stephens heritage from the early days at Stonington. Family members interchanged the two spellings. Many rare ancestral photographs are included, with 9 generations of descendants that span the years from 1668 to 1908. 240 Years! An index of 46 pages provides reference to thousands of kindred including in-laws of this great Colonial American family! Price $6.95 USD. 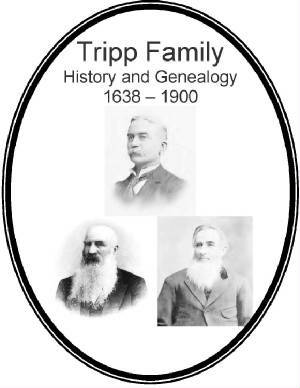 Tripp Family History and Genealogy. PDF eBook English 6.02 MB 1903. There are 11 generations of Tripp family members in this publication with essential dates on family descendants that range from the year 1638 up to 1900! There are several photographs along with a 13 page index which contains hundreds of Tripp ancestors and in-laws! A great reference for the Tripp family genealogist! Price $6.95 USD. Deacon Family History and Genealogy. PDF eBook English 2.16 MB 1895. The early legend of the Deacon Family is described in this eBook which dates back to the year 1066 A.D. Essential dates of family descendants are documented from the year 1480 up to 1887. That provides over 400 years of family lineage! 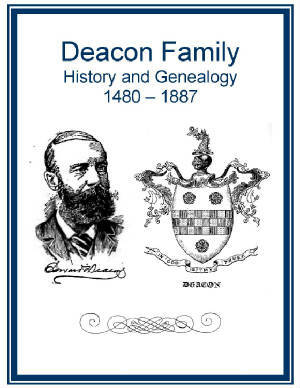 A treasure of information for any Deacon family genealogist! Price $6.95 USD. 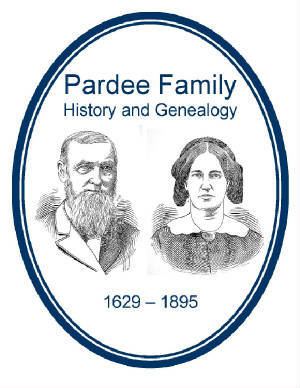 Pardee Family History and Genealogy. PDF eBook English 5.50 MB 1896. The history of the Pardee family is written in story book form, and describes how records were saved from the British Troops during the time of the American Revolution. At least 5 generations are compiled with essential dates on family ancestors ranging from 1629 up to 1895. Over 260 years of family lineage! Great information on one of Americas long standing Colonial families that branched out all over the world! Price $6.95 USD. Sprague Family History and Genealogy or Genealogy in part of the Sprague Families in America. PDF eBook English 1.60 MB 1902. 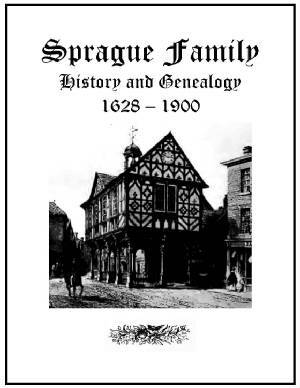 This eBook will bring “Glee” to the “Sprague” family with essential dates of family descendants that extend from the year 1628 to 1900… over 270 years! There are 9 generations documented, which will be a treasure of information for any Sprague family genealogist! Price $6.95 USD. 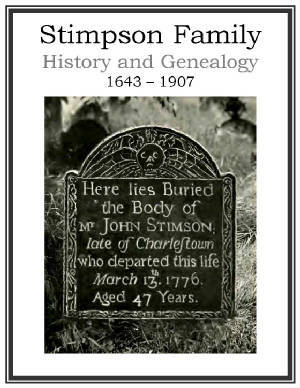 Stimpson Family History and Genealogy PDF eBook English 13.1 MB Year 1907. This eBook contains numerous rare family photographs, ancestral wills, declarative statements, and a 27 page index of hundreds of kindred names. Vital dates for Stimpson descendants range from 1643 up to the year 1907. Over 260 years of family tree statistics! A source of important documentation to extend the family genealogy! Price $6.95 USD. Shimer Family History and Genealogy or History and Genealogy of the Shimer Family in America. PDF eBook English 6.23 MB Year 1908. 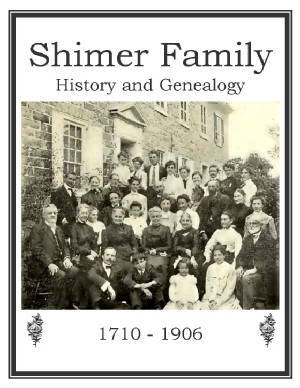 Recounting the Shimer family roots from 1710 up to 1906 this eBook contains data gathered from old Bible records, church records, tombstones; also from deeds, wills, and other official documents, which were found in court houses, college archives, and public libraries. Contains numerous rare ancestral pictures including reunion group photographs. Seven generations are listed. A detailed artifact for the Shimer family genealogist! Price $6.95 USD. Sturges Family History and Genealogy or Solomon Sturges and his Descendants. PDF eBook English 3.27 MB Year 1907. 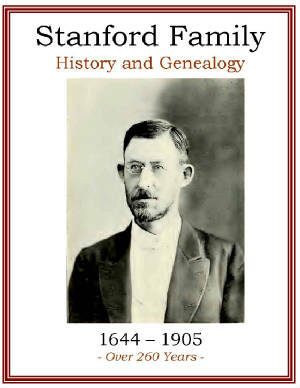 An excellent history of the Sturges family which contains numerous rare ancestral photographs, 4 generations of descendants that span the years from 1796 up to 1906, and an index of 4 pages with over 550 kindred names! 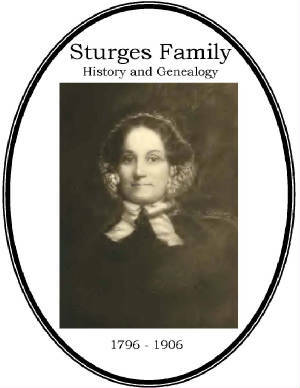 An excellent resource of family stories and documentation for the Sturges family genealogist! Price $6.95 USD. 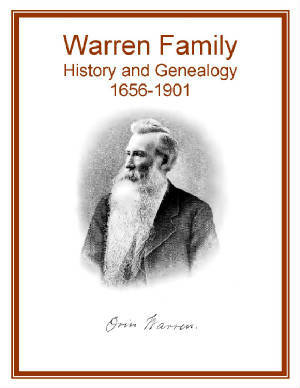 Warren Family History and Genealogy PDF eBook English 5.60 MB 1901. When Cromwell gained victory over the Scottish troops at Dunbar he banished the Scottish loyalists to America. Family legend is that James Warren was among them. He married Margaret who was from Ireland. There are 7 generations in this outstanding eBook that spans the years from James and Margaret in 1656 right up to the year 1901. An index of twelve pages lists over 700 family members! This is a valuable genealogical resource for Warren family members! Price $6.95 USD.